Mardi Gras Bedazzled mask is from Gypsy Renaissance's Mardi Gras Collection. Bedazzled is a purple, green, and gold sequin mask with real peacock feathers. 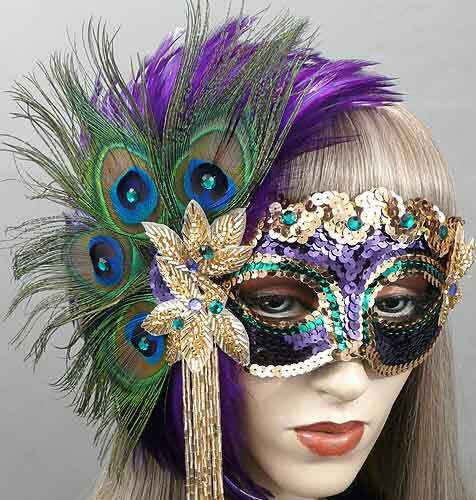 Mardi Gras Bedazzled mask is covered with regal purple sequins and decorated with green and gold sequin trim. Mask is adorned with a semi-circle of regal purple feathers overlaid with peacock eyes. Mask is embellished with gold glass beaded leaf appliqués and a cluster of glass beaded loop dangles. Finished with amethyst and emerald rhinestones. Bedazzled is also featured in our Sequins & Sparkles Collection.